Although the economy has improved some over the last few years, it doesn’t seem to be getting a whole lot better for most Americans. A good way to save money is to downsize your home. This is especially a good idea if you have already raised your family and you and your husband are left paying a mortgage on a home that is too large for you. Let’s take a look at how downsizing your home will help you to save a bit of money, to live more comfortably as well as some easy ways that you can downsize. One easy way to downsize is to look for a home that has a small garage or even no garage at all. If you and your spouse are living in the home alone and your children are grown it is likely that you don’t have a bunch of stuff to store in a garage. Buying a home without a garage is a great way to get more house for your money and to downsize your payment. Finding a home without a lot of land is another way to downsize and to save big. You can find a lot of cute houses on the market these days that don’t have a ton of land with them. It is also good to find a home without a lot of land if you are older and don’t have the stamina you once had to do all the yard work that is involved with a house with a lot of land attached. Buying a home that is one story is also a good way to downsize and to save when it comes to buying a new home. Buying a home without stairs is good for when you get older as well because you won’t want to or may not be able to climb them once you get up in years. Realize that you don’t have to give up on the home of your dreams when you downsize. There are plenty of adorable houses on the market that won’t break your bank account that are 1500 square feet or less. Don’t let society dictate to you that you need a large house in order to fit in. 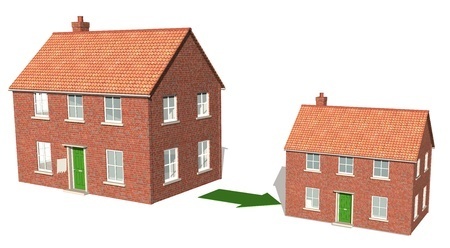 There are plenty of upsides to downsizing to a smaller home! Once you set your mind in the right direction and you realize that you don’t need to have a huge house and that it’s no longer important to “keep up with the jones’’ you will be well on your way to saving a lot of money. If you are like an increasing number of home owners, you may well have recently thought about leaving your spacious house for a smaller residence. Reasons for wanting to do so are numerous and varied and range from an empty nest, to burdensome maintenance chores, to financial considerations, to a desire for a change in lifestyle. 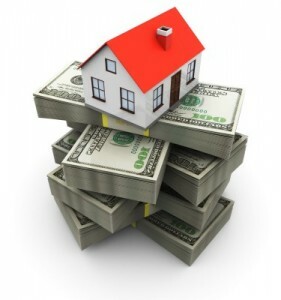 Lower mortgage payments, utility bills, and property taxes. Extra time and money to allow a change in lifestyle. Less space for guests—and storage. 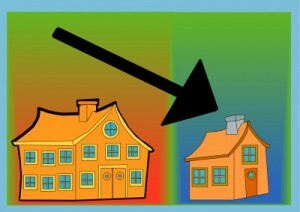 Unexpected costs of HOA fees and assessments, higher utility and tax rates in new location, moving expenses. Why do I want to downsize? What are my wants and needs at this stage of my life? Where do I most want to live? In what kind of residence? How important is size to me? Can I deal with less storage space, closer living quarters—and the resultant lack of private space? Will I miss living in a large, prestigious house? What can I part with—home itself, furnishings, possessions, friends, convenience of location? What will the move cost? How will my monthly/yearly bills be affected? How will such a move affect my desired lifestyle? How will downsizing affect my ability to entertain and be socially active? How much can I reasonably expect to net from the sale of my current home? Have I sought out advice from a Realtor, an accountant, friends who have downsized? Have I thoroughly researched HOA fees and restrictions, transportation costs, distances, medical facilities, the community, and desired amenities? With the summer season upon us, we need to tend to a few maintenance tasks before we can settle down in a hammock without a care in the world. Keeping in mind the adage, “A stitch in time…”, we need to test the garage door opener in our Orlando FL home, check the air conditioning system, and service the lawn mower to ensure a breakdown-free summer. When was the last time you thought about your garage door or its automatic opener? 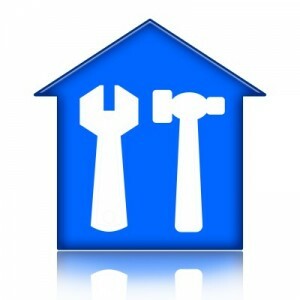 Like any mechanical system, the door and opener need some periodic, preventative maintenance. If you live in an area of frequent thunderstorms, a tight, well maintained garage door can also help prevent expensive results of a storm-ruptured door. The Door & Access Systems Manufacturers Association International has a good guide to help you inspect and test your complete garage door system. It’s a good idea to make monthly inspection and testing a part of your regular routine. Sweltering temperatures may be just around the corner, and your best defense is a central air-conditioning system. If you have one at your Orlando FL home, there are a few things you can do to make sure that it’s tuned up and ready to go when the summer heat arrives. Before you start tinkering with the system, however, it’s important to have a basic understanding of: the condenser, the blower unit, and the ductwork of your system. Visit the DASMA website for a complete explanation and instructions on how to fine tune it. Many small tasks are involved with getting your lawn mower ready for reliable summer use. Check, belts, blades, all bolts and fasteners, tires, and wheels. If you have fuel older than 30 days stored in containers, not use it. Any idea when you last changed the oil? Drain it and replace it with oil the manufacturer recommends. Consider, too, replacing the sparkplug—if you do, add a couple drops of engine oil into the hole, and then replace the plug. Check your air and fuel filters and replace if they are dirty or clogged. Follow the recommendations found at LawnCare.com. Once you’ve completed these chores, feel free to visit yet another website for more suggestions—simple ones– on how to maintain your Orlando FL home during the summer months. So much for hammock time! Should I Increase the Mortgage On My Orlando Home to Pay Off Other Debts? Consolidating credit cards and loan debts into your Orlando home mortgage can seem a ‘no-brainer’ – after all, given the size of the debt, mortgage payments are really low, aren’t they? However, it’s not necessarily the win-win strategy it seems. 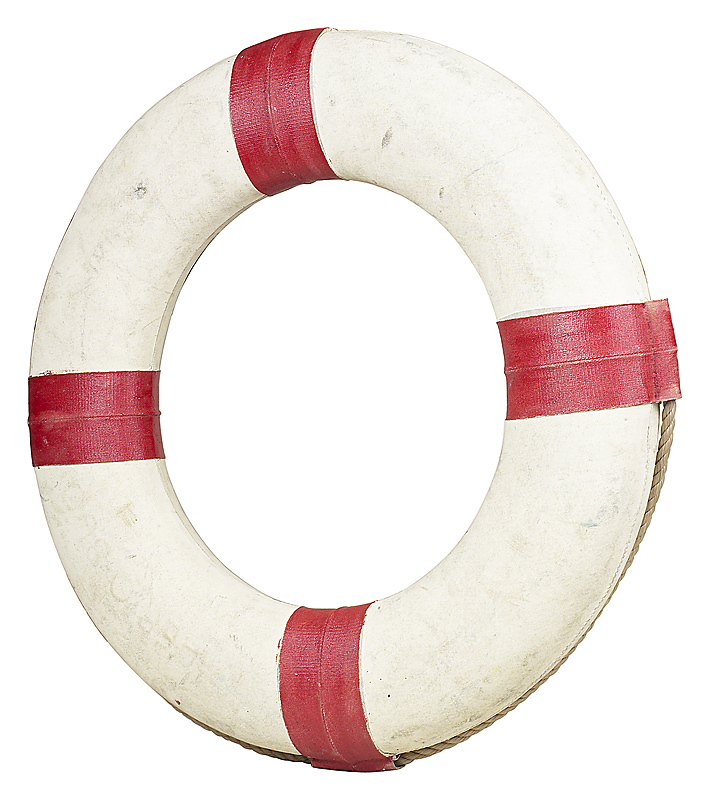 To learn more about whether debt consolidation is right for you read this article by Money.Co.UK. 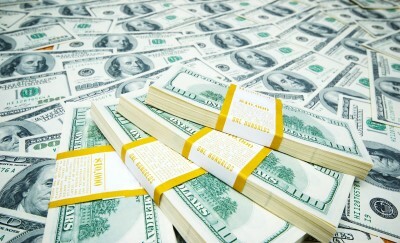 Yes it is an article from the UK, but it offers some really useful tips and information about finance that a lot of people misunderstand and some solid advice that applies no matter what country they happen to live in. There were 12,128 Orlando FL foreclosure homes in March 2012, according to RealtyTrac.com. The average sales price of an Orlando home was $126,288 and the average sales price of a foreclosure home was $104,270, a $22,018 savings. 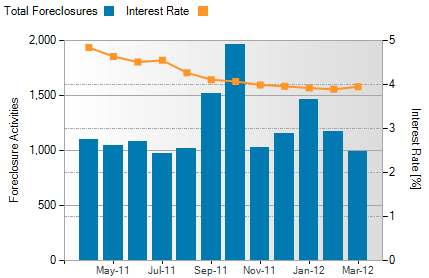 The interest rate on a 30 year mortgage was 3.95% in March and there were 986 new foreclosures compared to 1,171 new foreclosures in February. 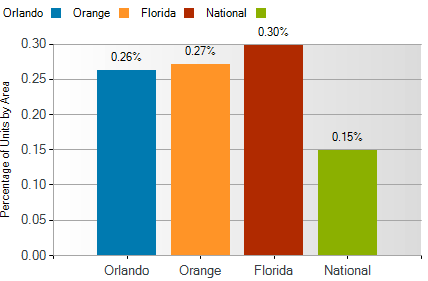 Orlando FL foreclosures were 0.11% above national statistics, 0.04% below Florida figures and 0.01% below Orange County numbers in March. Aside from fires, gas leaks, and spills, a lot of us are unaware of the other potential dangers in our homes. Either that or we have forgotten about the other possibilities because they tend to be rather small. And by small, it does not mean that the consequences can’t be detrimental, it means that the incident just may not be as obvious or immediate as a fire or spill. It is true that virtually everything in a home can be seen as dangerous in one way or another, but there are definitely certain things that you should be careful of. To do so does not involve much effort, simply just some awareness and memory. So to jog your memory, here are some common potentially dangerous things to beware of in your Orlando FL home. This information can be especially useful if children are running around the abode. TALL & HEAVY FURNITURE. This is mainly for children, but for adults too – dressers, bookshelves and the like are privy to crushing people when being climbed on or knocked over. A quick fix would be to attach furniture to the wall. CORDS. Not only are cords dangerous due to their electrical components, but if placed inappropriately can act as an object to trip over. Make sure your cords are organized and out of the way. BATHTUBS. Like cords, bathtubs are dangerous in more than one way. People are very prone to slipping in tubs, so be sure to place a good mat in your tub. Secondly, if you have young children, watch them at all times while bathing to avoid drowning. This also goes for when preparing a bath for yourself – don’t leave a full bathtub unattended. MEDICINES & CLEANING PRODUCTS. The same rule is applied to both medicines and cleaning products – do not leave them in reach of children and pets. They can be very toxic, harmful and even deadly. It is likely we have all been taught this rule, but it can be easy to forget when rushing around the house. EXERCISE EQUIPMENT. Similar to the last tip, make sure exercise equipment is out of children’s reach. Heavy, mobile objects like weights can be tripped over or can be dangerous if a child decides to make them their new play toy. Also remember to clean your equipment after use because they can harbor sickness-inducing germs. PESTICIDES & MOTHBALLS. While both can be very useful in removing unwanted pests, the chemicals in each can be very harmful in the long run. You may choose to limit use to when very necessary, find a safe alternate solution, or opt for not using them at all. It may be a small sacrifice to make in order to ensure good health.